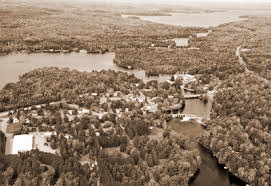 Place mouse pointer on photo to see the beautiful fall colours and the blue waters of Lake of Bays and the Muskoka River. 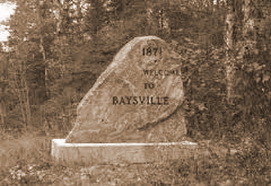 Place mouse pointer on photo in order to bring colour to the welcoming sign embedded in a huge slab of local granite. 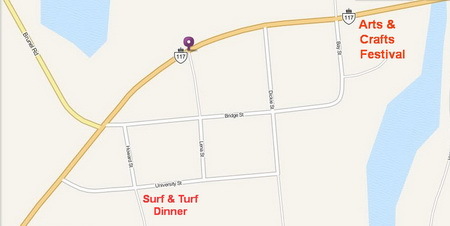 Our Arts and Crafts Festival takes place in Gristmill Park and Robertson Parkette and our Annual Surf & Turf Dinner with a Live and Silent Auction is held in Baysville's Community Centre. 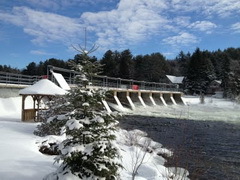 The Baysville dam, which is featured in the above slides, takes on a different look during the winter season. This is the time of year when the Riverfront Group volunteers take a short break from attending the planning sessions for our featured events. 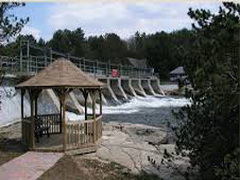 Well the winter snows have melted and the water is flowing at a brisk rate as it begins its journey from the Lake of Bays to Lake Muskoka. The gazebo, which is pictured above, was one of the many projects that the Riverfront Group managed. Another gazebo was built in Gristmill Park but eventually it had to be removed for safety reasons.